If you’re like most of the young people who find a home at The Center for Theater Arts, you’re passionate about music and the arts. Curious about the world of ideas and culture that swirls around you. And excited about the idea of performing. This is a place where you can explore who you are in a warm, supportive environment. Where you can find your voice, develop your style, and find out more about the role you will play as a performer and as a person. Because The Center is uniquely centered on you. We offer an award-winning professional curriculum of more than 80 classes in the performing arts. 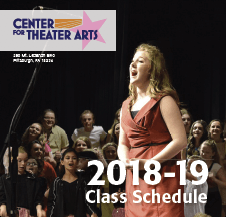 We will teach you the skills of singing, dancing and acting, and we will guide you through the disciplines of rehearsing, practice, process, and working with other artists to bring a production to life. Whatever you bring to this experience, we will use it as a way to help you gain confidence, self-image, and a better understanding of who you are. We opened in 1981 with 127 students. Today, after 38 years of growth and development, we are a community of more than 500 young people of all ages and abilities, working toward the common goal of self-discovery, with a constant focus on support, development and fun. Our alumni include Broadway stars, scholarship awardees and hundreds of young people who have gone on to rewarding careers in the performing arts. There are also hundreds of CTA alumni who are successful business professionals, teachers, doctors, lawyers and parents. Wherever they go, they all draw on their experience at The Center to play a better role in the world around them. Classes are held weekdays from 4:00pm to 9:00pm and Saturdays from 9:00am to 3:00pm. The Center operates two 15-week fall and spring semesters. We also offer two summer sessions, a four-week camp that begins the third week of June and a two-week camp that begins the first week of August. The Center’s faculty strives to provide students with an appreciation of the performing arts that will enrich their lives. With a faculty of 25 university-trained arts educators, we are committed to surrounding our students with instructors who have extensive performing arts and teaching experience. Guest artists also conduct workshops throughout the year. We are a 501(c)(3) Non Profit Organization. All of our funding goes directly to our program. Your contributions and sponsorships help us do the best possible job of developing young lives and building a better community. The Center for Theater Arts is a 501 c(3) Non – profit organization that is so very proud of WHAT we do and WHY we do it!! 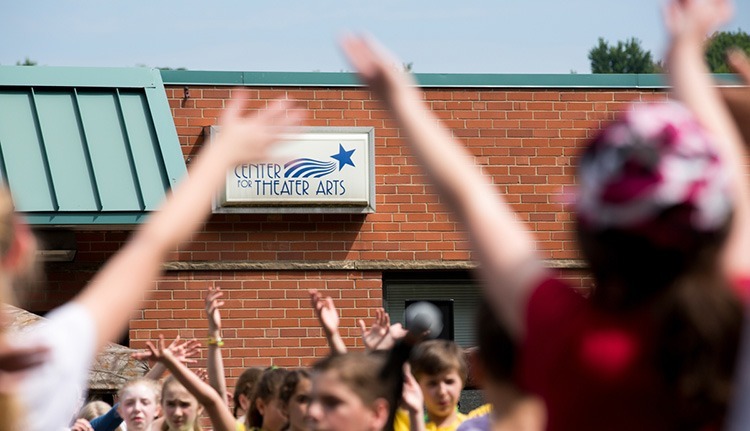 For over 38 years, CTA has been offering high quality performing arts instruction with a fun, creative, challenging and exciting curriculum. In addition to our dynamic classes and productions, we provide an environment where we all have a role to play!!! We are much more than a place to take voice, dance, musical theater and theater instruction. I am confident that having classes at CTA will be something your child will value the rest of their lives! Billy is very excited to be celebrating his 10th Anniversary as the Executive Director of The Center for Theater Arts. He is thrilled to be leading the very same school where he learned his love of theater 25 years ago. 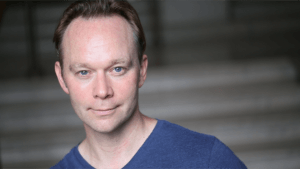 Billy received his BFA in Theater Arts in 1993 and later returned for his MA in Curriculum and Instruction in 2008; both from Point Park University. Billy has written curriculum and taught Acting and Musical Theater for the Performing Arts faculties of The Pittsburgh High School for the Creative and Performing Arts (CAPA), the CMU Pre College Program and the PA Governor’s School for the Arts. He is also an active member of the Arts Education Collaborative (AEC). As an actor Billy has appeared on Broadway, off-Broadway, in films, television and in regional theaters throughout the country. Currently he can be seen singing and dancing in the movie musical “CHICAGO” (Miramax). He is thrilled to have been invited to perform in both the 75th Annual Academy Awards (ABC) and The 25th Anniversary of the Kennedy Center Honors (CBS) where he danced in a tribute to Chita Rivera. With over 1000 performances on the Broadway stage to his credit, Billy has been featured in the “Original Casts” of three Broadway shows: Side Show, Footloose and Minnelli on Minnelli: Live at the Palace. Other highlights include productions with Front Porch Theatricals (BIG FISH) New York City Centers ENCORES! (HAIR), The Paper Mill Playhouse (Follies), The Goodspeed Opera House, The Kennedy Center for Performing Arts, The Manhattan Theater Club, The Arizona Theater Company and Lucille Lortel’s White Barn Theater, Pittsburgh City Theater, Pittsburgh Public Theater, Pittsburgh CLO, The Pittsburgh Playhouse, Pittsburgh Symphony Orchestra (Tribute to Fred Rogers), The Pittsburgh Opera, Other TV/Film credits include: Striking Distance (Columbia Pictures) Guilty Until Proven Innocent (Movie of the Week) The Macy’s Thanksgiving Day Parade (NBC) The Today Show (CBS), The View (ABC) and numerous commercial spots for the PA Lottery. His Favorite Leading Lady: his wife Sharon and his Favorite Role: Being a Daaadddy! The Center offers scholarships for one class to families with demonstrated financial need. To qualify for financial aid, students must complete a financial aid form and meet certain financial criteria based on the Federal guidelines of the School Lunch Program. Paperwork must be completed and returned for consideration. All students must re-apply for financial aid each year prior to the start of class. A registration fee of $25.00 per family per semester applies. Please contact the Center for Theater Arts for more information and to receive a scholarship application.